Blue eyeliner is so '80s, right? Wrong! It's so right now for so many reasons and we think you should get on board with the trend and wear blue eyeliner. Blue eyeliner is fabulous for lots of reasons. You might think it's old-fashioned and gaudy but it all depends on how you wear it. There is a big difference between a smudge of badly applied blue eyeshadow and a slick blue liner. It's actually quite fashionable. Everybody can wear blue eyeliner, you just need some inspiration to show you how to wear it well. There are so many ways to do it. 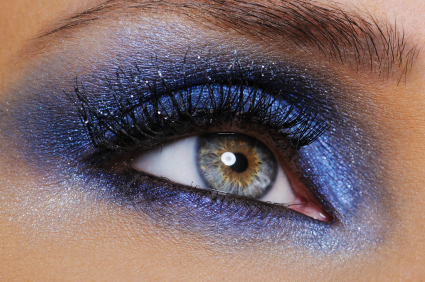 You can go for a very normal brown smokey eye with just a tiny nod to blue just in your waterline. That's probably the easiest and least offensive way to experiment with the trend. Or you could take it one step further and blend out the blue waterline liner underneath your eye for more of a pop. Thank you for my amazing hair and make up @secretspauk @gemma_thompson_makeup . Sorry for the picture @spencermatthews and all of his teeth were determined to be in my selfie ? You can just wear a blue line across the upper lid. If you go for an eyeliner flick you can wear it with little else. Keep it simple and really sharp. It doesn't matter the colour of your eyes, though blue is ideal on brown eyes. It will make them stand out like nothing else can. However, even if you have blue or green eyes you can still wear blue. It becomes a monochromatic colour scheme and looks really cool. You can go all out with your blue liner like Kim K. For this look, you can use a kohl pencil and scribble it all around your lash line along the upper and lower lid. Then use your best blending brush to buff it out to perfection. If you drag out the edges, it will give it a really polished and deliberate finish. Giving it a feline shape ensures you won't be mistaken for an '80s throwback. Do you like the blue liner look?